Brendan Kaiser (center) explains the electronic brace created by his team, which also includes Cooper Davis (right), Cooper Fiedler and Mohamed Fareed, at Thursday’s Engineering and Technology Capstone Showcase. Computer programming majors Matthew Mitar (left) and Joey Alexander created a device and app to help minimize beverage waste in restaurants and bars, called The Dream Stream. The Dream Stream just might be the last call for alcohol … waste, that is. The beverage inventory system, developed by Grand Canyon University computer programming degree candidates Matthew Mitar and Joey Alexander, is no mere fizzy concoction. It’s serious business when it comes to the business of running a restaurant or bar. It’s well known that restaurant and bar profitability is guzzled up by overpouring, liquor spillage and drink giveaways. According to a September 2015 article in Restaurant Magazine, the National Restaurant Association reports that 75 percent of inventory shrinkage happens as a result of theft, leaving 25 percent shrinkage — the loss of goods — from overpouring, spills, giving away drinks and wrong pricing. “Actually, we can track that. … No one’s getting away with anything,” Mitar said with a smile on Thursday afternoon at the Spring 2019 Engineering and Technology Capstone Showcase in the Engineering Building, an event organized by Strategic Employer Initiatives & Internships with support from the College of Science, Engineering and Technology. 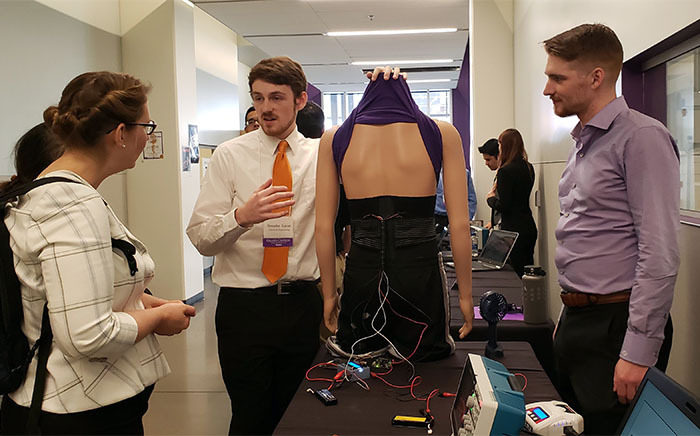 Mitar and Alexander were just two of dozens of students, mostly seniors, presenting some 35 engineering and technology projects to the GCU community — and to industry professionals on campus for advisory board meetings. Computer science seniors Matthew Jibben and Natalie Kidd spoke about their machine learning project. As capstone projects, these weren’t just any ol’ mere mortal projects. The first semester was the designing-and-planning phase, followed by bringing those designs to light this semester. The full academic year of designing and programming, building and testing represented the culminating work for computer science and computer programming students as well as biomedical, mechanical and electrical engineering students. They gathered four years of sweat and tears, culled all the academic knowledge they gleaned at GCU and poured all that savvy into these final assignments. Their work spanned the gamut, from machine learning, such as computer science seniors Matthew Jibben and Natalie Kidd‘s look into artificially intelligent gameplay (they wondered if they could create a neural network that can play a game as well as or better than the average human), to video game design, wheelchair design and data-crunching apps. The Showcase was special because among the presenters were students who will be part of the first cohort of engineering graduates at the University. In just two weeks, they will walk the stage at commencement in what will be an important moment for GCU, which has made STEM education a priority. Mitar and Alexander soon will be part of that STEM workforce, but on Thursday they focused their thoughts on their Dream Stream, a device and app designed to more accurately track beverage inventory to minimize waste. The device can measure how much liquor in a bottle has been poured. It communicates with a server, which allows an app to have access to that data. The Dream Stream can keep track of what liquor might be the most popular, and “it can notify me if I have, say, four bottles left in inventory,” said Alexander, who worked in the restaurant/bar industry for a time. A wind tunnel filled the courtyard area outside the Engineering Building. It was just one of the projects displayed as part of the Spring 2019 Engineering and Technology Capstone Showcase. Outside the Engineering building, two gargantuan-sized wind tunnels overtook the courtyard area. Two teams designed two different tunnels with the idea that future engineering classes behind them might use the tunnels for their aeronautics projects, such as to test the flow of air over airfoils, like a model airplane wing. “We only achieved a tenth of the power of what we originally wanted,” said mechanical engineering senior Michael Teberg, who said his team’s wind tunnel operates on 110 volts. A little known fact their professors might not have known: “We finished this up an hour ago,” Teberg said of his team, which also includes Grant Senechal, Hunter Hoyt and Marcel Hardy. A second wind tunnel design-and-build team exceeded the 110 volts in their power needs. “In order to meet our power requirements, we needed a power source that could generate 220 volts,” said mechanical engineering showcase presenter Hector Romero. The team, which also includes Daniel Hausbeck, Kayla Douglas and Tobin Morse, had to find a generator with enough power capacity to run the wind tunnel’s fans. Electrical engineering senior Denisse Delos Santos said her team wanted to help developing countries with their energy needs by designing and building a Solar Powered Charging Station. 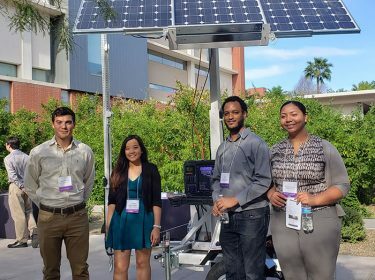 Also communing in the courtyard was the Solar-Powered Charging Station team: electrical engineering students Yabal Fesehastion, Denisse Delos Santos and Mayumi Perry, and mechanical engineering student Luke Milliken. “The Solar-Powered Charging Station was inspired by the lack of accessible energy in developing countries,” said Delos Santos, a native of the Philippines who has a heart for energy concerns in places like her native country. Developing countries don’t have access to the kinds of energy sources that nations like the United States enjoy. From left, Luke Milliken, Denisse Delos Santos, Yabal Fesehastion and Mayumi Perry said their phone-charging station can be used in remote locations without ready-to-go outlets, since it relies on solar power. The charging station is a 24-hours-a-day, seven-days-a-week, solar-powered device that charges cell phones. Because it relies on solar power, it can be used in isolated locations without “ready-to-go” outlets, such as military bases or remote research camps. But Milliken pointed out it could be used right here at home, too. 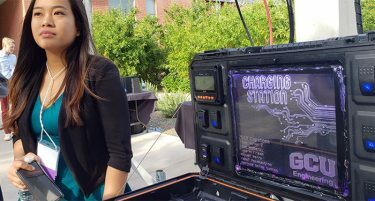 “It can be used at GCU at basketball games, graduation and also at camping events outside,” he said, noting how Lopes who camp out to be the first in line at basketball games could have a readily accessible place to charge their phones. As a security precaution, the charging station includes video cameras for security. It’s also weatherproof and portable via a lightweight, Gator-type vehicle. Mechanical engineering major Cooper Fiedler’s team designed an electronic brace with three functions — heating, cooling and electrostatic therapy — to help those who have sustained muscle injuries in their lower lumbar area. The brace is just like a compression sleeve, Fiedler said, which is worn to help muscles recover from activity. The team’s prototype device is a large band that wraps around the lower back and is connected to a series of wires. Fiedler said the thought is to make the device more elegant so that it operates via a single chip rather than a bouquet of wires. Charinee Chantarasak (right) explains her team’s PayPal Microsoft HoloLens project, which filters and streamlines an overload of information that employees see at the PayPal Command Center. Computer science major Brandon Neuheisel’s team, which just presented its work at the College of Science, Engineering and Technology Symposium two weeks ago, invested its time into finding a way to streamline information for PayPal Command Center employees. That’s where the team — its other members are Brennan Robin, Rushabh Shah, Jamie Graham, Charinee Chantarasak and Michael Namoff — observed the barrage of data barreling down on employees from every angle. “Every person had three to five monitors in front of them,” Neuheisel said. The team’s solution: Use augmented reality and a MicroSoft HoloLens headset so that the wearer can choose what data he or she wants to see. It’s like what Tony Stark in the “Iron Man” films does when he sees data floating in front of him and can manipulate that data with a midair swipe, tap or click. PayPal employees can do that, too. But, unlike Stark, they must wear the HoloLens device to do it. “It’s essentially a filter,” Robin said of the HoloLens. Computer programming major Aaron Ross (right) created a digital portfolio so students can share their projects with employers. Computer programming senior Aaron Ross presented his project, Hubfolio, a digital portfolio that goes beyond what a traditional resume has to offer. He got the idea for Hubfolio because popular professional networking sites such as LinkedIn, which allows users to post their curriculum vitae and resume, are so limiting. He wanted a way to not just show employers past experience but also a way to showcase his projects. With Hubfolio, the user’s work is presented chronologically in a timeline-view format. The goal of the program is to bind a student or job applicant’s projects together. Not only did Ross present his capstone project on Thursday, he also landed a job at PayPal. He’ll be working as a global technology support engineer and will talk to merchants and developers about bugs in the code. “I’ll be squashing bugs,” he said with a smile. It was a good day for Ross — and it was a good day, too, for the College of Science, Engineering and Technology.